It's been a pretty busy week for me! I got the Society6 shop up and running (HAVE YOU BEEN YET CAUSE IT'S AWESOME! /shameless self plug) and then I had a live-animal sketching lesson with Claire on Friday. We went to a pretty quiet little natural history museum associated with the Forest Preserves of Cook County, the Trailside Museum of Natural History. I wanted to start her drawing live animals somewhere we could get close to the animals and where it would be less crowded than the zoos in our area. I think one of the assignments I'll have Claire do next is to pick an artist and try to recreate a piece of their art as well as create a new piece in their style. I've been pretty active on Instagram and there's one artist that has really inspired me, Peter Carrington, with his style. He's super talented at laying down his lines and I wanted to try doing something more like that on this sketch. It's not perfect but I'm pretty pleased! What did you guys sketch this week? It's been a busy week here and the sketchbook definitely shows it! This is from a relative's house we were at for a party. It was a beautiful rustic cabin decorated with tons of moose antlers and the like. It was gorgeous and a great time was had by all! And from last week's visit to the Field Museum we got a lot of drawing done. I was able to get this drawing done of a Triceratops horridus fossil. Some of you may have seen this already on the Instagram–if you haven't you can follow me @megtopus! And we did some sketching from the Egyptian collection. 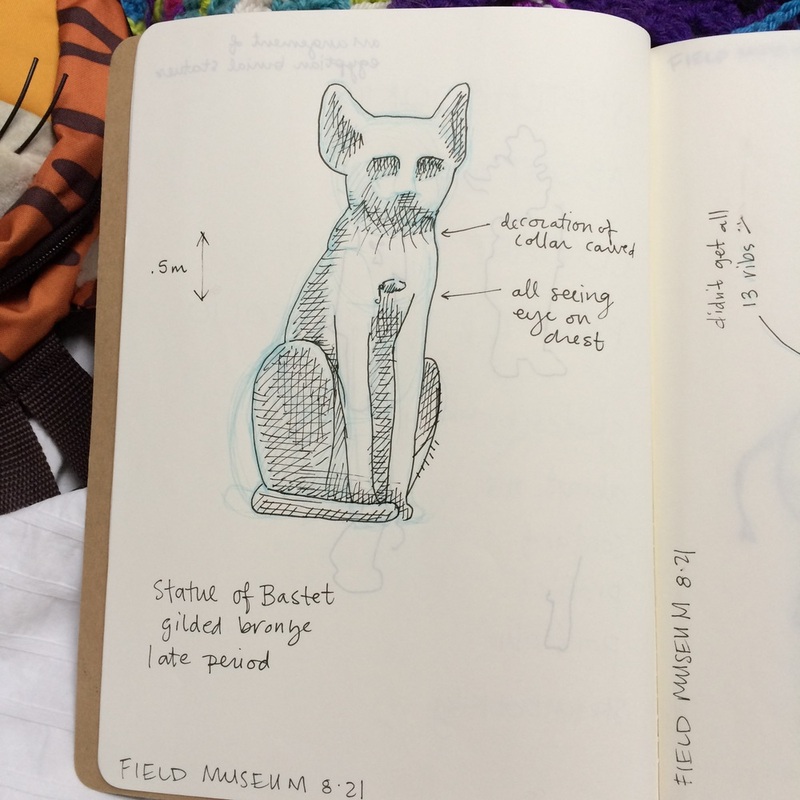 Here's a statuette of Bastet, the cat goddess. 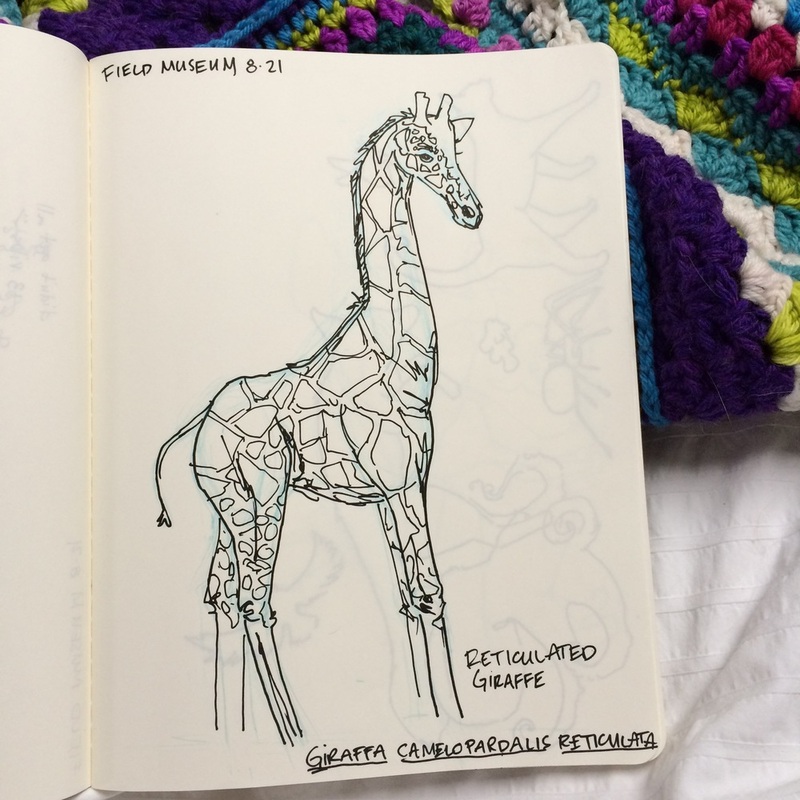 Our last big sketches were done of a beautiful giraffe taxidermy from the mammal hall. These animals are so beautiful and beautifully taxidermied; Claire and I both love studying them for our work. Phew! That was a big update! What drawing did you guys get done this past week? What are your plans for the coming days? Today's excerpt from my sketchbook is in memoriam of a friend and very special person who passed away yesterday. I don't do calligraphy very often (though I enjoy looking at other people's work immensely) but I felt his memory deserved my best efforts. You'll be missed, King Corgdahd.